Disclosure: Marvin’s Magic Showtime was provided for me in order to facilitate my review. All opinions are my own and honest. I am disclosing this in accordance to FTC Guidelines. Please see “Disclose” tab for more information. What child doesn’t love playing? Most importantly what child doesn’t love to play with magic? I have two children as well as teach, so I know that kids love to play tricks. 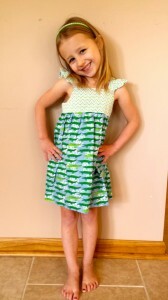 I promise you that Marvin’s Magic Showtime is the perfect fit for the little magician in your life. A superb collection of easy – t0 – perform large scale magic tricks, perfect for small hands. A complete magic show includes a cute, plush rabbit glove puppet! Colorful magic props to amaze and amuse. Marvin’s Magic Showtime is a winner of The National Parenting Center’s Seal of Approval! This magic set is absolutely incredible. My girls really love the Rabbit Glove Puppet, and of course the magic wand! Whenever we have someone over, the girls get so excited to show this to the first person that enters. My girls are a little young to be able to do very many tricks ‘well’,but they love trying and doing their best. They are very fortunate to have many people around them that are very encouraging and help them to feel very proud in what they are doing and what they are learning. If you are interested in purchasing Marvin’s Magic Showtime, you can head on over to the website and get the kit for only $39.99. 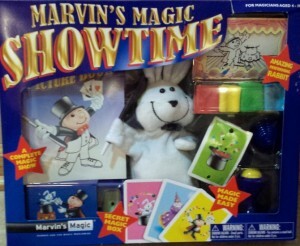 1 Lucky winner will win Marvin’s Magic Showtime! This giveaway is open to U.S. Residents only. Ends August 11th. I like Marvin’s Magic Fifty Pranks to Freak Your Friends!! Marvin’s Magic 25 Amazing Tricks & Stunts. My daughter would love the magic drawing board! I like Marvin’s Magic Fifty Pranks to Freak Your Friends!! Thanks for the giveaway! I like Marvin’s Magic Fifty Pranks to Freak Your Friends. Thanks for the giveaway! I am excited. I hope I win the prize. My kids would love the Magic Lights from Anywhere. i like Marvin’s Magic 25 Amazing Tricks & Stunts. Thanks for the giveaway! I am excited. I hope I win the prize. I would donate this to a charity for needy children. We would have a lot of fun with the Marvin’s Magic Drawing Board. Thanks for the giveaway! I am excited. I hope I win the prize. My son would love the Red Soccer table. He was really into watching the World Cup this year and I know he would enjoy that. I think he would enjoy Marvins Incredible 250 Card Tricks. Thank you for this giveaway. I am sure he would enjoy this. I think the Lights From Anywhere trick was the neatest. But my kids I’m sure would like the kit you’re giving away the most.